The Codex Vindobonensis 2652 which was brought to Vienna in 1806 from the royal imperial Ambraser collection (in order to ensure it falling into French hands) and in 1936 fell into the possession of the manuscript collection of the National Library of Vienna, belongs to the oldest and most extensively complete rhyming German losbuechern. 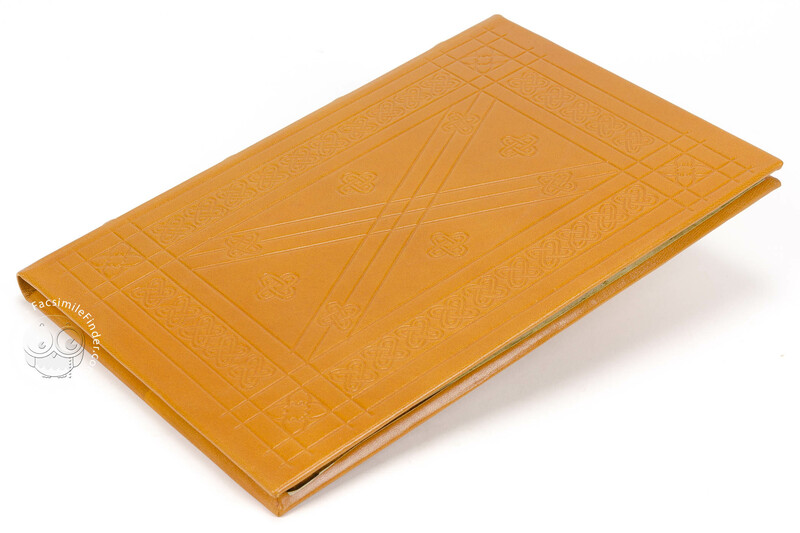 Like all medieval codices of its kind, it stands amongst a long tradition of prognostic literature when the collections of dictums are valid as the origin for use in solemn rites in ancient Greece. 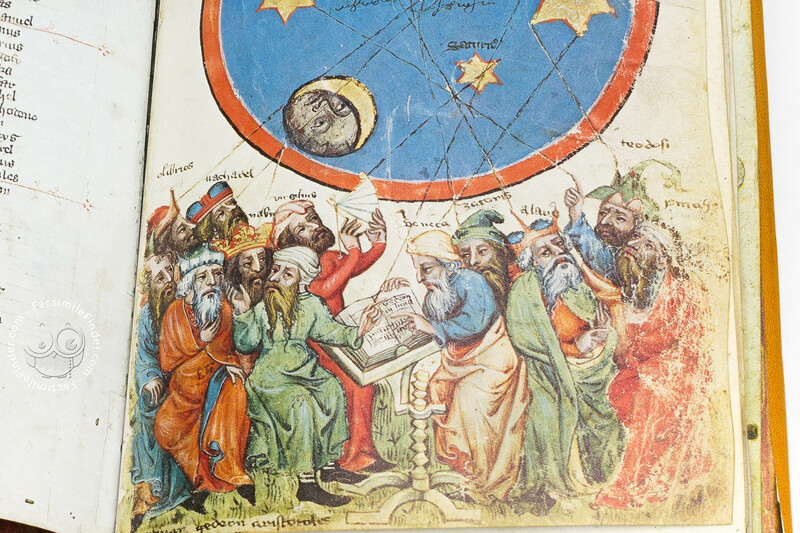 In the Near East, the fate of the codex further developed.With the translation of Arabic works into Latin in the 12th century, interest in future research was awakened, also in the West and the speculative component of Astrology was philosophically supported and scientifically legitimized. Early on in the German text of the losbuch a break had already been made away from the idea that one was inescapably thrown into the hands of fate and turned instead towards the concept that everyone was individually responsible for their own fate, so that by the end of the 14th century a shift was initiated from purely prophetic texts to one of a supporting nature and thereby changing the role of the losbuch. The emergence of our manuscript falls within this transition period. The presentation of the questions and answers moves between the area of serious faith and fear of life on one side and ridiculed amusement on the other. As in other losbuechern, the rarely used number 36 (or 3 x 12) determines the total structure of the text. 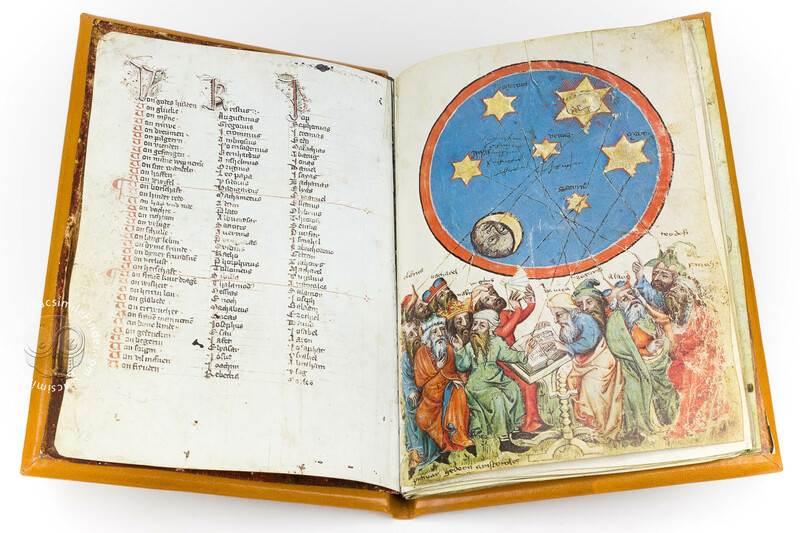 It acts on the assumption that the 36 facies figurae or imagos of the stars in the 12 positions of the zodiac are arranged so that every image makes up 10% of the entire ecliptic (the so-called Decanus-Prophecy). From a list of altogether 36 theme questions posed, 36 verses of answers follows for each question, whereby every question on every one of the 36 pages is answered one time. 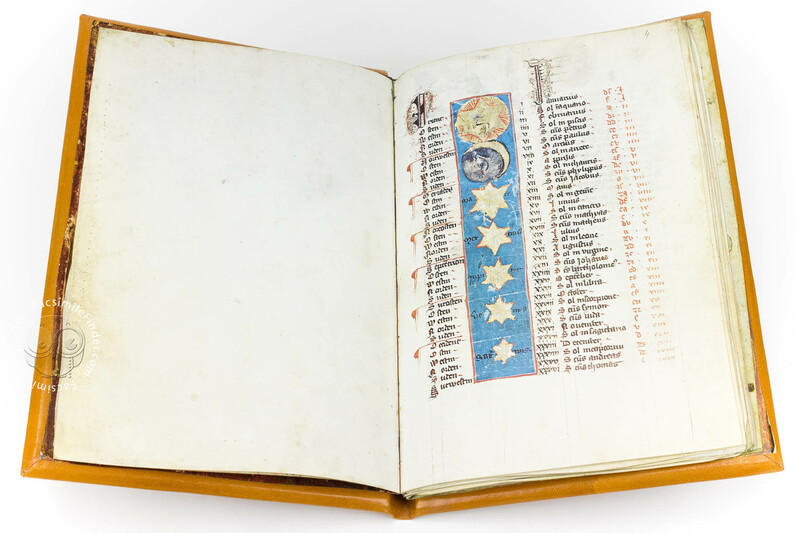 The illumination of the existing codex is not limited to the small figures of the zodiac, celestial bodies, images of the months and figures of the apostles appearing above the columns of text, but rather partially overlaps the entire folio page (fol. 2r and 2v). 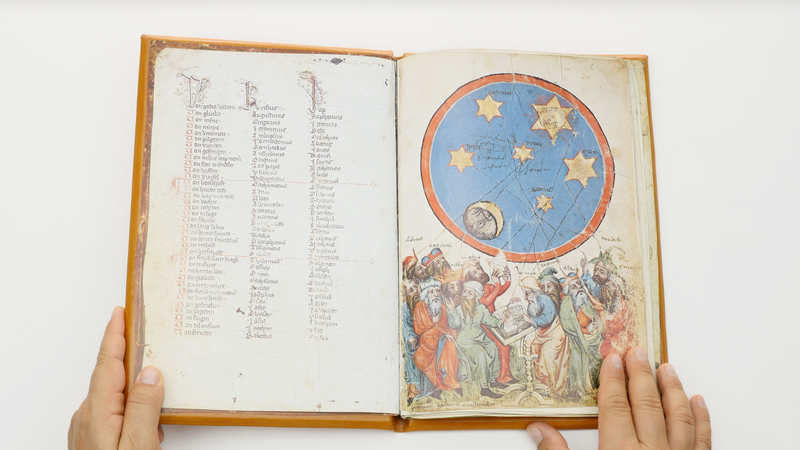 The advice of fortune or fate comes from the seeking of answers in a direct way (without explanation or clarification in the text) but rather by way of a wooden turning wheel of stars i.e. 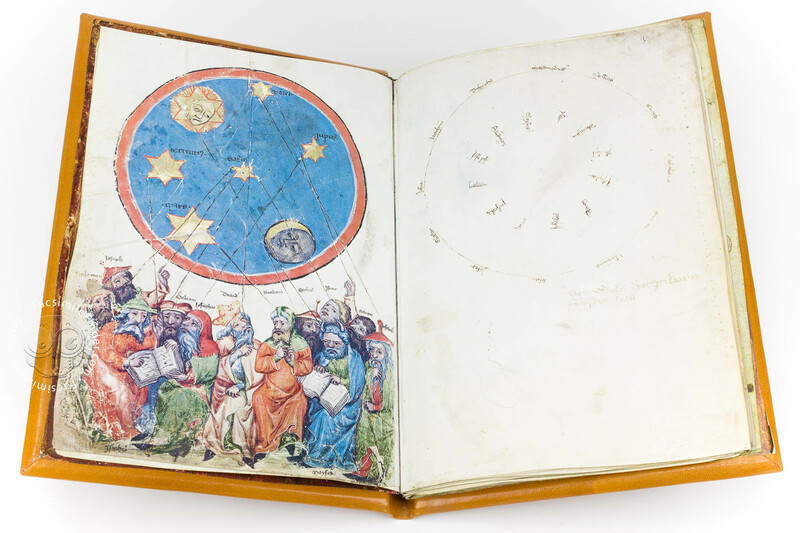 an astrolabe (a planimetric representation of the star-filled sky) which was moved to the inside cover of the book. 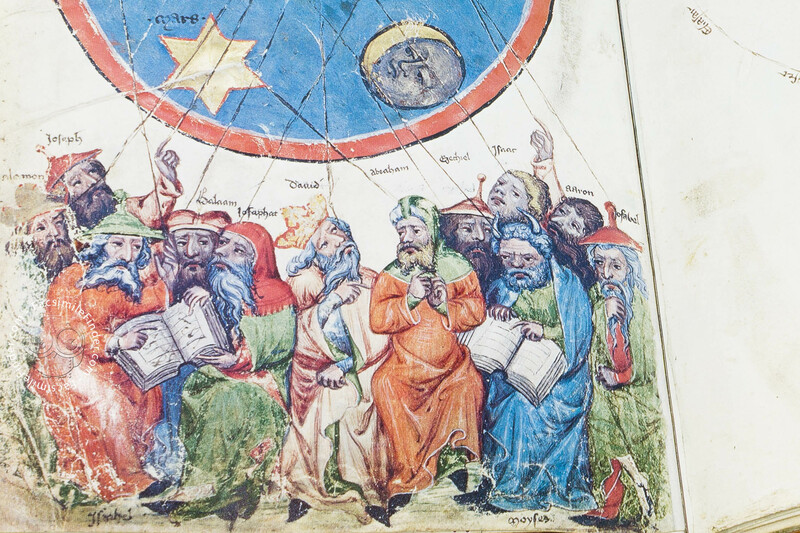 A fixed pointer picks out a particular question on the astrolabe. 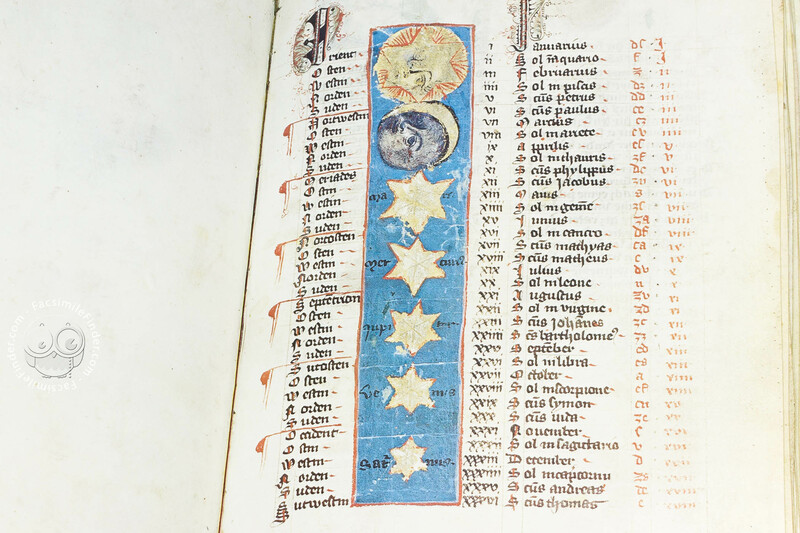 The answer is unfolded from a section of the zodiac, which one is aligned under and indicated in the text of the losbuch. 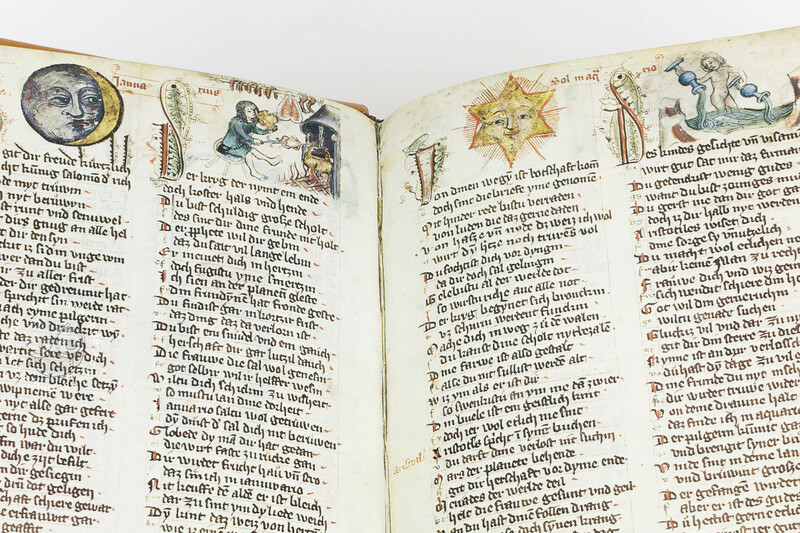 Furthermore the various themes from the losbuch only appear once on a given page.The use of the wheel of fortune, which is based on the ancient concept of the wheel of random fortune, lends evidence that the existing codex is an example of popular, unscientifically oriented prophecy. The firm list of questions and completed answers offered as well as the accompanying simple instructions for use, made it possible for the astrological layman to use the astrolabe.Investigations of the geography of languages of the Gothic writing and text references which point to the Rhein, Mainz and Aachen indicate the developing area of the losbuch to be the middle of West Germany. 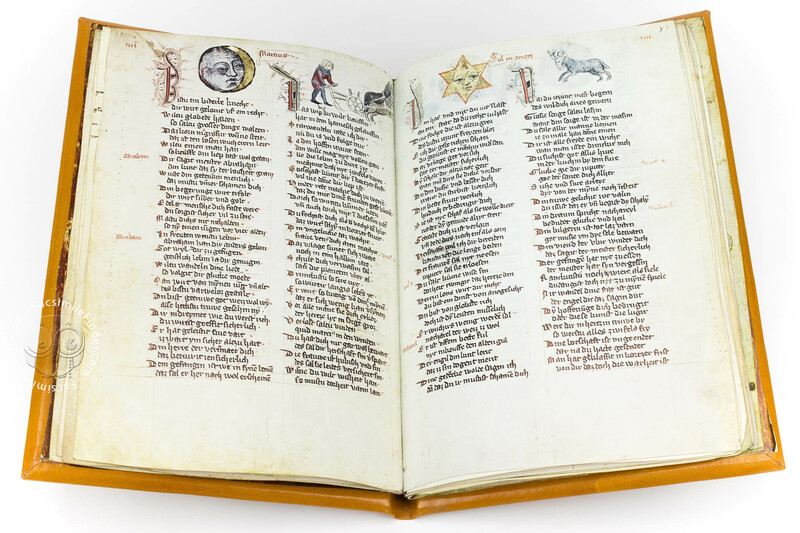 The Losbuch was created at the beginning of the 14th century in the comital chancellory of Limburg as a commissioned work. 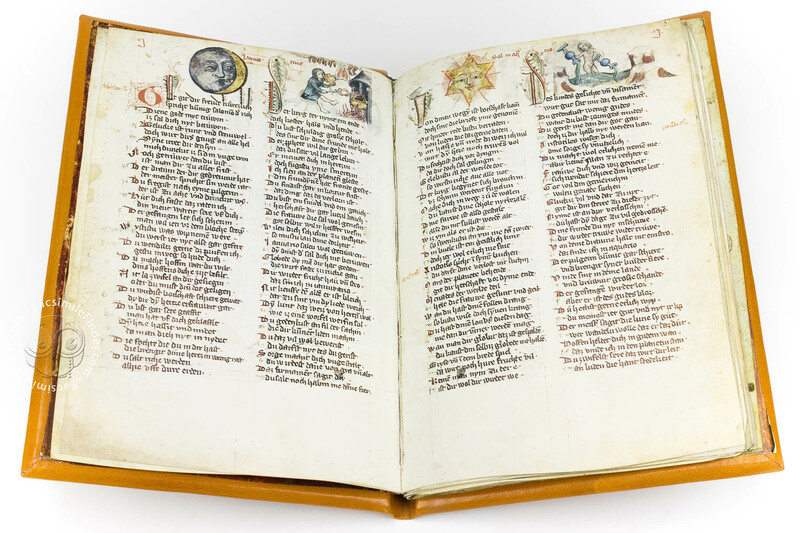 Its specific importance lays in the altogether 1296 (36x 36) couplets, which clearly vary between a position of unshakable confidence in the validity of the answers of the losbuch and a skeptical and every now and again even ironical attitude towards the expression of this prognostic art. To this day, barely any other comparable work reflects this ambivalent relationship so well. 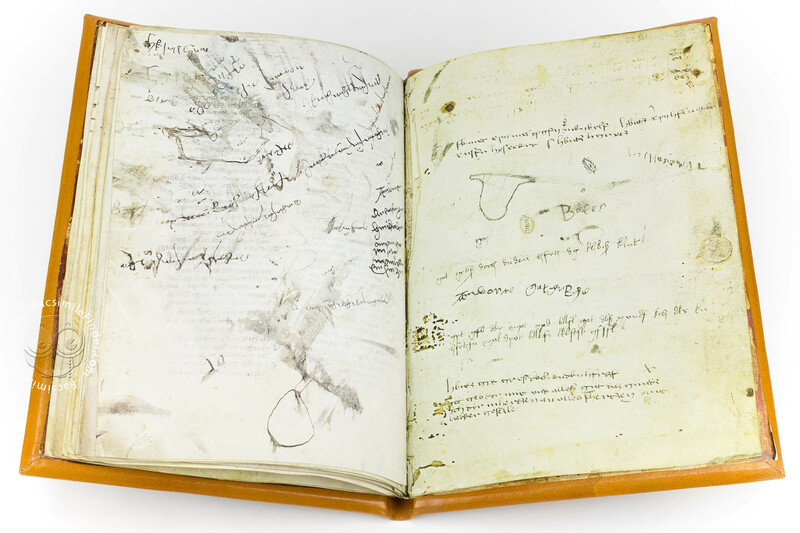 Manuscript book on parchment − 29.5 × 20 cm − 46 pp. 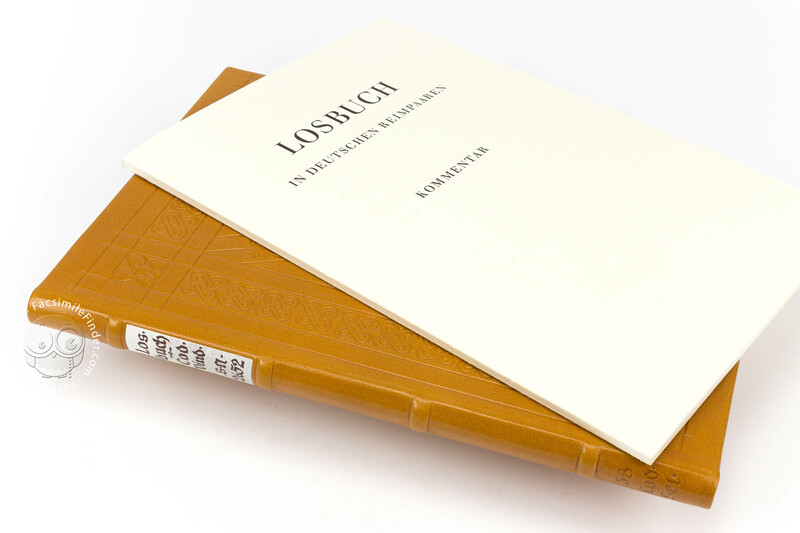 Full-size color reproduction of the entire original document, Losbuch in deutschen Reimpaaren: the facsimile attempts to replicate the look-and-feel and physical features of the original document; pages are trimmed according to the original format; the binding might not be consistent with the current document binding.